Update: Woohoo! Thanks to your votes, I won and am now the proud owner of ten pounds of prawns. Today, I woke up to something I haven't heard for the last few days. Silence. No pots clanging, no loud, festive Pakistani wedding music, and no uncle singing off key to accompany the aforementioned festive music. See, for the past few days, our house has been home to numerous friends and family members who came together to celebrate Thanksgiving on Thursday and my brother-in-law's wedding on Saturday. We figured if we were going to have one giant event that required lots of planning, preparation, and coordination, we should tack on a second. 'Cause that's how we roll. Needless to say, the past ten days have been filled with constant chatter, many tellings (and re-tellings) of embarrassing family stories, and way too many singing uncles. Oh, there was also a day when I made Thai green curry for twenty. The same day that someone drank the last of my coffee. And the same day I told this coffee thief that he could not have any of my curry for dinner for his blatant violation of my coffee rights. But that's a story for another blog post. This is a blog post about the beauty of silence. Well, silence and pho. A few days ago, the good folks at Marx Foods sent me a glorious sampling of their dried chiles for their "A Chile & A Spoon" recipe challenge. Bloggers were asked to create an original recipe for a dish that requires a spoon to eat. Oh, and we had to use at least one type of chile in the recipe. Challenge accepted! I mean, I love chiles. I sprinkle cayenne on my pizza, dot my eggs with sriracha, dip potato chips in Valentina hot sauce, and mix samba oelek into my chili. So when the wedding guest crescendo would reach an all time high and uncles were running around shrieking about transporting us to the hotel, aunts were running around shrieking about their outfits, and kids were running around shrieking just 'cause, I would close my eyes and think of my chile recipe. It would be warm. And spicy. And comforting. And I would make and eat it in silence. So today, my first day of silence in quite some time, I did just that. I found a giant bag of nondescript beef bones in the freezer. I threw them in a pot, covered 'em with water, and let the concoction simmer for a few hours. At about the half way mark, I tossed in some whole spices, including cinnamon, cloves, peppercorn, bay leaf, star anise, whole coriander seeds, and three beautiful Japones chiles. I know that most people opt to season their plated pho with sriracha but I felt it important that the broth have its own heat. Towards the end, I seasoned the broth with fish sauce, salt, and wait for it... azucar mascabado. Fancy, I know. I'm guessing brown sugar would work just as well. I happened to have the muscovado sugar and figured now was as good a time as any to give it a whirl. Oh, and I guarded the simmering broth like a ninja. Spending ten days in a house filled to the brim really helps hone your survival-of-the-fittest mentality. 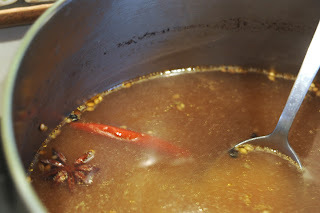 Once the broth was ready, I drank a giant bowl of the aromatic, spicy, warm goodness all by itself. I mean, I taste tested to make sure the flavors were balanced. Then, I added the cooked rice noodles and ate another bowl. I mean, taste tested again to make sure the noodles worked with the soup. Finally, I made myself a third bowl, I mean, first bowl, with noodles, topped with thinly sliced flank steak, and poured the hot soup on top. I topped the mixture with some homemade chile sauce because well, you can't receive a giant supply of chile and not make your own chile sauce. And on my fourth bowl, I mean second bowl, I realized I kinda missed the wedding party chaos, the shrieking kids, and the cackling aunts. But not the coffee thief. And certainly not the singing uncles. After all that, how can you not sympathize and vote for my entry? Go here to vote! Disclaimer: I received a complimentary sampling of dried chiles from Marx Foods. I was not compensated in any other way. The recipe and family chaos is my own. Cover beef bones with water and boil for approximately one hour. 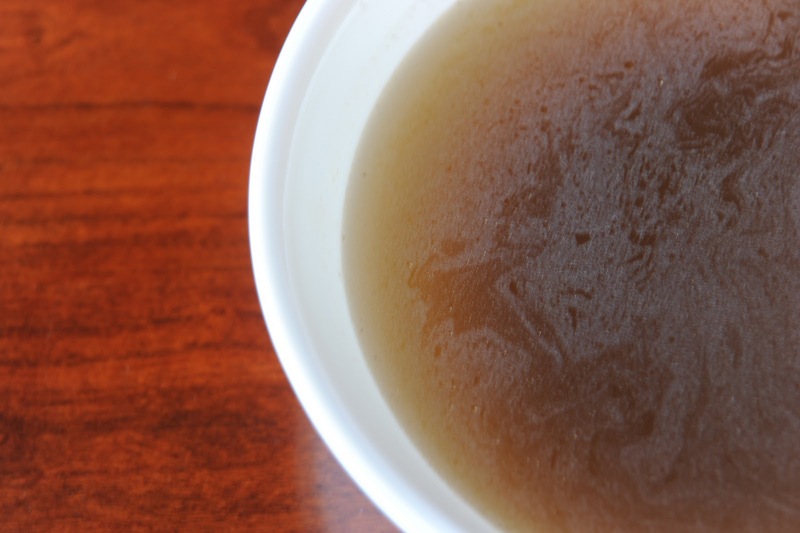 You may need to skim the surface of the stock a few times at the beginning. Add the onion and dried spices. I guess you could tie up the spices in a cheesecloth bag but I kinda like the spices floating around freely. Oh, and I don't own any cheesecloth. Boil for another hour. Add fish sauce, salt, and sugar. Boil for another hour. Taste and adjust seasoning. Cook rice sticks according to package directions. Add to bowl. Top with sliced flank steak. Pour boiling hot broth on top. The broth should cook the flank steak. Add toppings. I stick with chili sauce only because I've spent four hours concocting the perfect beef broth and I'm not about to corrupt it with things like bean sprouts and mint. Enjoy (in silence or in chaos)! 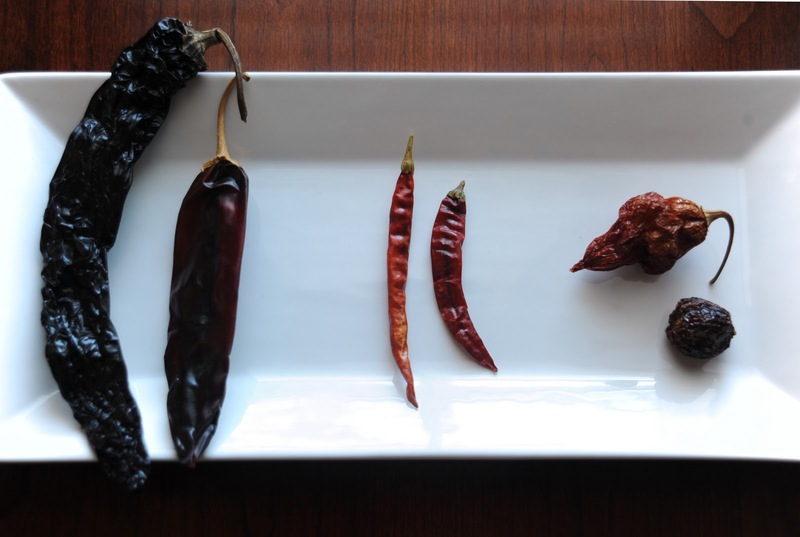 Check out the uber-detailed post on reconstituting dried chiles on the Marx Foods website. Get distracted by the crazy, huge selection of products. Move on to the section on culinary techniques. 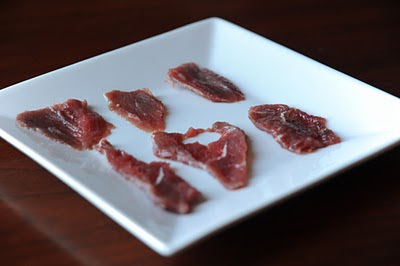 Read about how to cut up a rabbit fryer. Remember that you're trying to make chile sauce and you'll likely never come in contact with a whole rabbit fryer. 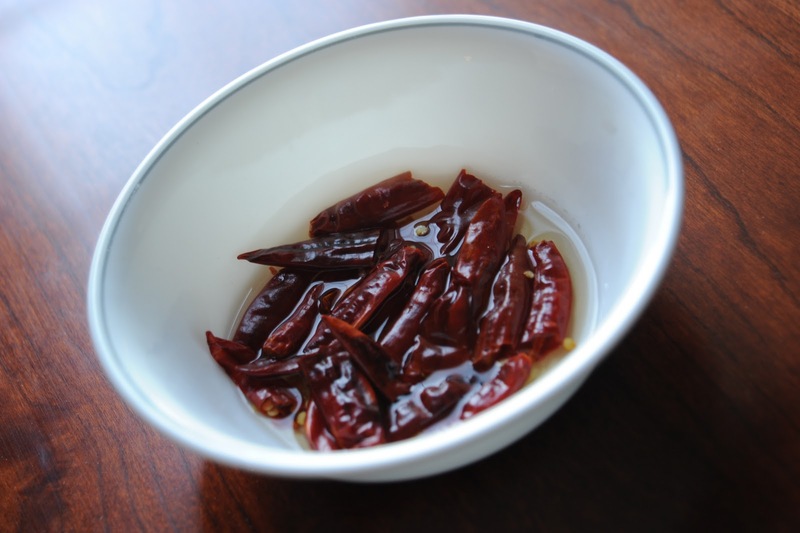 Remove stems from dried chiles and reconstitute 'em. Add the vinegar and blend in a food processor. Cook for about five minutes, seasoning with salt and sugar to taste. I'm in the mood for lighter soups these days and I'm adding yours to my list! Pho, on a cold morning like this, would be so perfect. I would have had four bowls myself, especially with your homemade chile sauce. Love it! Ah, peace and quiet. It's so much fun to have family visit, and it's so much fun to have them go home. Your soup sounds delish. I'm so glad that you have a quiet house again...especially because you've had time to blog! This looks divine. I have never had Pho before but now I really want to try it! Ahhhh, I love quiet and pho! Both are so calming. I'm sure your crazy week offered many "fun" memories you'll be able to appreciate better after you had a few more days...and bowls! I have yet to make pho. Boy am I proud of you! I wish I was there to share a bowl with you. Glad that you're enjoying silence and tranquility. Enjoy the tranquil--you've earned it! Haha...I'm liking the way you guys roll ;-). Party hardy! On the other hand, I'm glad you guys finally have the house to yourselves again and some silence. My kiddies and I love pho! In fact, we go out almost every to my uncle's restaurant to eat it. I'm so lazy to make it at home sometimes. Although one pot can easily last us two or three days. I'm so impressed with your skills each tine I visit your blog Azmina! This sounds delicious and very authentic. Two thumbs up in my books! Yumms! Oh singing desi uncles. I am glad the "hungama" is all over! Oh my. The story by itself was worth everything and now the recipe as an added bonus. Thank you so much for sharing the amount of warmth that the holidays, your love for this dish and the recipe hold. I love the taste tests. Beautiful presentation of the pho-- I love making my own pho, I char the onions and ginger and it gives it a great sweet flavor to the broth. MM I want a bowl right now. This looks delicious!! wow, you definitely did a great job with this challenge! Looks delicious! that the food is not poisonous before I serve it to my guests. 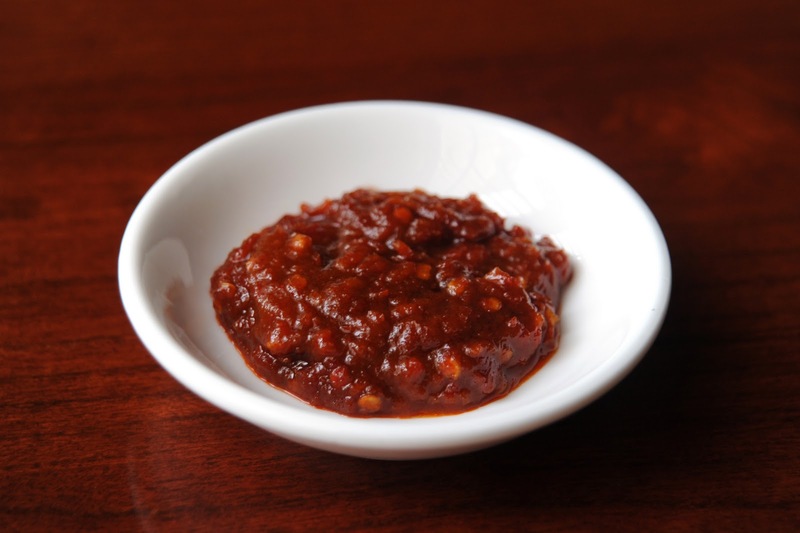 Thank you for the chili sauce recipe! I will try it! Looks delicious like always! And I bet the spicy chiles completed the dish! Family drama! Gotta love it. Or hate it. Or both. Sounds like you had one CRAZY weekend! Nothing like sitting down to a nice bowl of spicy soup though. Keep a little bit of excitement from the heat while cleansing yourself of all the super rich food you are sure to have eaten. Good stuff. Oh my this sounds delicious! I've tried pho once before but wasn't too happy with how it turned out - I think adding a little spice to the broth might just help! This soup looks so perfect for the cool weather. I've been really wanting to try my hand at more Thai cuisine, thx for sharing! Yummy, love the spiciness and all the garnishes! I hope you found an outfit for your BIL's wedding! Yum!!! I just voted for you, good luck!!! I puffy heart Pho!! Way to reclaim your space -- I too have endured the South Asian family wedding madness. I have never made my own pho...but I sure do love ordering it when I go out. I'm eager to give this recipe a try! I enjoyed hearing your thoughts on family and silence. It is wonderful to have people together, but there is something magical about the day after everyone leaves...silence is beautiful! Thank you so much for sharing! Have a great Thursday. Azmina - it's absolutely beautiful! Pho has to be one of my favourite soups ever. Bookmarking this - never made from scratch before. Good luck in the contest! 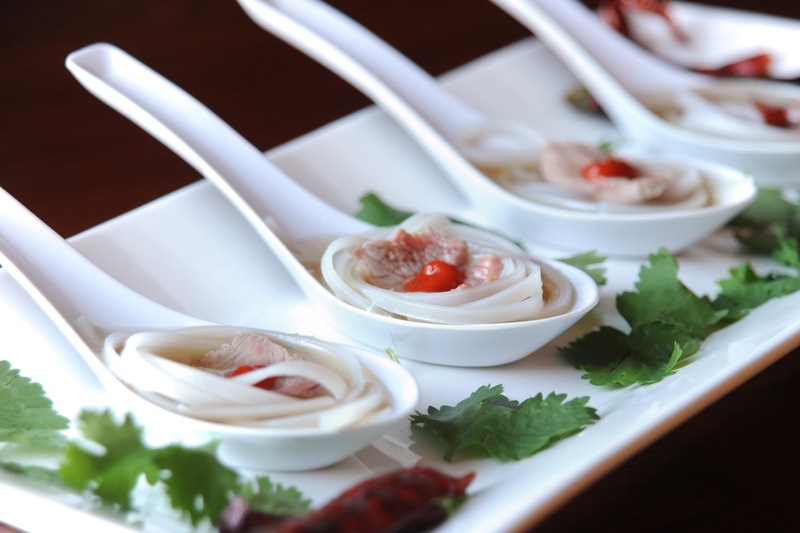 Great Pho recipe! I love Pho so much that I frequent my local Vietnamese rest once a week...no kidding! :) Good Luck! OMG I AM NOW OFFICIALLY HUNGRY! Its so weird my husband was JUST telling me how much he loves Pho. While reading your post I kept thinking why is she describing my family :) This looks delicious , warm and inviting the perfect pick me up from a crazy family week ! MMM. I do love watching over a huge vat of simmering broth! If you like spicy soup, I will have to get the recipe to bun bo hue, a spicy beef vietnamese soup from the central region. 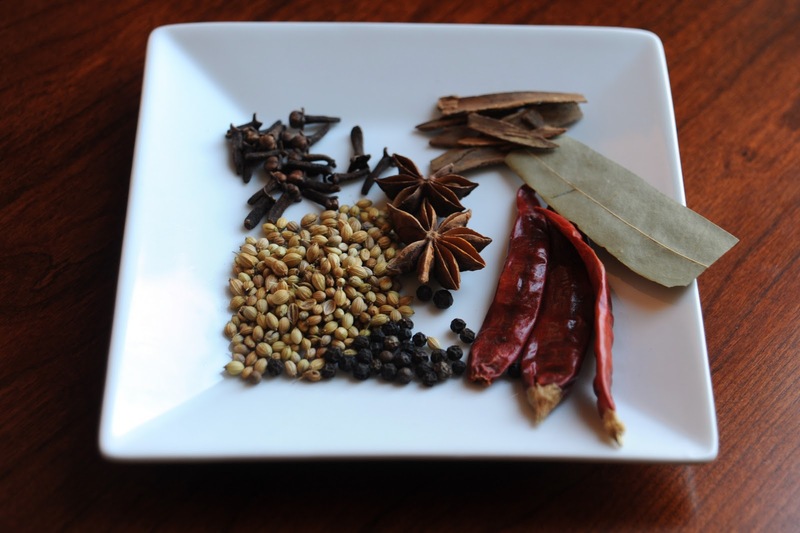 Think pho, less anise, more lemongrass, more spice. i love how pretty this looks:) thanks for sharing. Azmina, I just love your writing! I can completely relate, because my Serbian relatives are as noisy and shrieking as yours (although I cannot recall any uncles who love to sing, hmmmm). I love when I have visitors from the old country, and even though I cannot wait for them to leave, I am always sad once the house is silent. Your recipe sounds marvelous, and, yes, I'll vote for it. When my daughter comes home from Your neck of the woods for the winter break, we'll make the soup together. Whether it was four bowls (or two), no judgements here! ha If it's good, it's good. Great recipe you've put together. We've never made pho. Can you believe it? G'luck in the competition! This looks amazing! I am definitely going to try this-- it's so gloomy and cold here, so it's perfect weather for a bowl of hot, super spicy pho. I've tried your recipe 3 times now -- delicious every time! 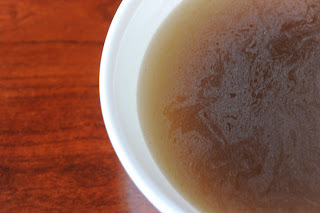 The only problem I'm running into is that I try to skim the fat off the top, but still end up with an oily broth. What am I doing wrong? Thanks for giving the recipe a go! I have a couple of suggestions. First, when you're staring at your pile of bones, try to pick off any giant, visible pieces of fat before throwing the bones in the pot to boil for the stock. Second, once the stock is made, let it cool completely. Then, refrigerate it for a few hours. The fat should solidify and come to the top and you can skim it off. And finally, I enjoy a bit of an oily broth. 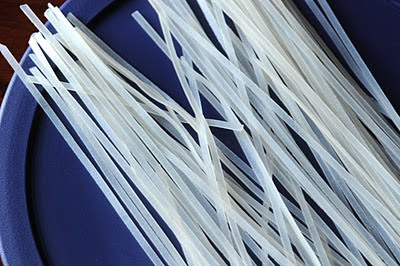 I feel it makes the noodles silkier :) I hope that helps!